Some people don’t like animals. But others are real-deal animal lovers. And when we get chance to help a fellow creature out, or in this case watch someone else do so, it’s pretty damn cool. Ted Bumstead is a deputy in Yavapai County, Arizona. Ted’s got eagle eyes and recently spotted a great horned owl, perched in a juniper tree. 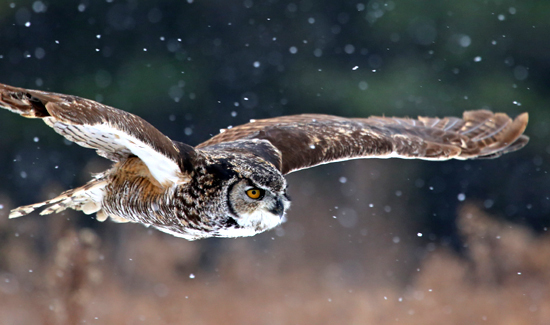 The deputy knew something was up because owls are nocturnal and you almost never see them during the day. So the deputy tried to figure out what the owl was looking at. Sure enough, owl number two was nearby- caught up and tangled in a barb wire fence. Bumstead freed the animal but recognized it’s wings were badly damaged. He called in some pros and the animal was taken to a rehabilitation facility. When the owl recovered, the animal people thought that Bumpstead might enjoy being around to see the magnificent creature he freed and rescued take flight. Thanks a ton Ted. You’re the man Bro! 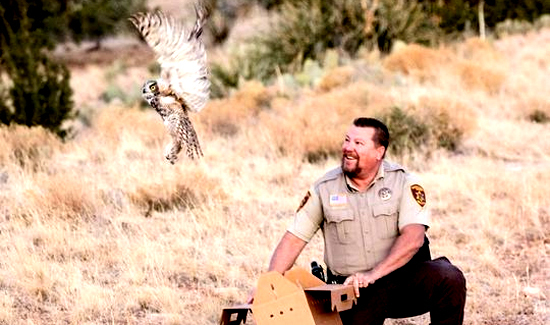 If you want to know what joy looks like- take a look at the deputy’s face as the owl takes off.